New and Improved database manager: When you install QuickBooks Desktop 2016 or later on your server, the database manager will now automatically perform network diagnostics for QuickBooks Desktop to function properly over a network (windows firewall ports being added, folder sharing and security checks, and ensuring the required services for QuickBooks Desktop to work over a network are started). Improved messaging for Multi-User issues: If you are experiencing problems opening your file in a network, QuickBooks will now prompt you with updated messaging that tells you exactly how to fix the problem. Elimination of the "Alternate Setup Mode": In order to ensure optimum performance and stability, the new version of QuickBooks no longer supports the Alternative Setup Mode. QuickBooks Desktop requires now the database server manager to be installed and functioning properly on your server (or computer designated as the QuickBooks Host). You can restore Alternate Setup Mode by following the steps below if you need it or run into problems with hosting Multi-User access. Note: If you have a NAS or similar device, the QuickBooks Desktop 2016 and later Database Server Manager will not install since it is not a supported Windows Operating System. Please refer to the System requirements for QuickBooks 2016 and Enterprise Solutions 16.0 article. You can, however, activate the Alternate Setup Mode following the steps below as a workaround. Ensure QuickBooks Desktop 2016 or later is installed on your server or computer acting as the QuickBooks Desktop host. Select Windows Start > All Programs > QuickBooks > QuickBooks DataBase Server Manager. Ensure the folder that contains your company files is showing in the QuickBooks Database Server Manager. Note: If your company file folder is not displayed, select Browse, then go to the location you store your file. Select Start Scan and wait until the process finishes. Open QuickBooks Desktop in Multi-User Mode on the workstations. Note: If you are still encountering H-series errors, see Error H101, H202, H303, or H505 when opening your company file for detailed instructions. This is intended for NAS drives or similar devices and if you run into problems with Multi-User mode. Important: The following steps are technical in nature, if you're not comfortable doing it on your own, please reach out to a qualified computer professional or IT person. On each workstation, you will need to perform the following steps. You do not need to edit anything on the server or NAS drive for these steps, just the workstations that are getting H-series errors. Make sure QuickBooks Desktop is closed and the QBW32.exe is not running in the task manager. Edit the QBW.ini file in notepad. 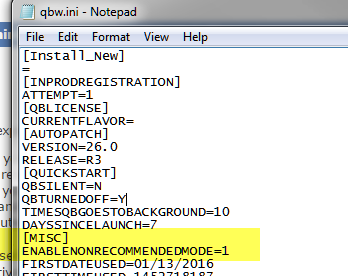 Save the QBW.ini file and open QuickBooks Desktop and try to switch to Multi-User mode. When you get the H202 error again, you should see the Alternate Setup button has returned if the .ini file has been correctly edited. Select Alternate Setup and select Yes to any proceeding UAC messages and QuickBooks Desktop should now work in the alternate setup mode and Mult-User access restored. Although not recommended, you can store the file on a server or NAS drive using Alternate Setup Method. Keep in mind that whoever opens it first in MU mode and select Alternate Setup becomes the host. If the host reboots or logs off while others are working in the file, QuickBooks Desktop will kick the other users out of the file and they may lose the work they’re doing prior to the crash. If you’re using NAS or similar device, it’s still best to use QuickBooks on a Windows machine to properly install the DataBase Manager and to maintain optimal stability.